Songs: New Nimkii* + What Did You Do Boy? Recorded at Harbourfront Centre – Concert Stage (Northern Passages Festival), July 21, 2017. Cris Derksen - What Did You Do Boy? 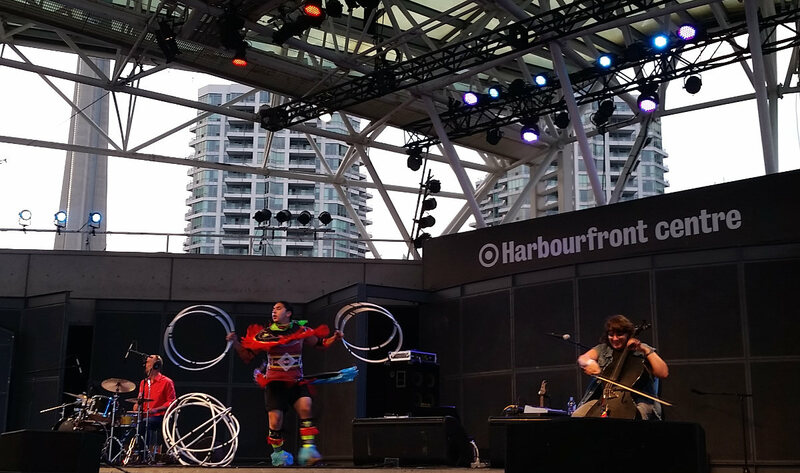 Having previously brought her Orchestral Pow-Wow project to Harbourfront, there was more room on the stage this time with cellist Cris Derksen performing with powerhouse drummer Jesse Baird. That left lots of room stage centre for dancer Nimkii Osawamick, who dazzled with his stunning hoop dance moves. Derksen's set covered a lot of ground, from delicate vocal ballads to raucous beat-driven instrumentals where her cello loops provide the "voices". Derksen has been busy working the folk festival circuit across the country (and beyond) all summer long, so it was a treat to see her in a brief stop back at home. Once things quiet down, there an album's worth of new material to be recorded, plus, I'm sure, reflections on the cognitive dissonance of playing songs like "Our Home on Native Land" to summer sesquicentennial crowds. * This is likely just a working title for this new piece. I will update when more information comes to light.